An overwhelming feeling came over me as I got out of a London cab in the middle of a warm day in Baku just a few weeks ago. Across from me stood a massive construction site. It reminded me of those sci-fi movies featuring abstract buildings, shapes and designs that bear little resemblance to reality. But then, that is a sci-fi movie. When you see a structure of those proportions in the real world, “overwhelming” is probably an understatement. There it was standing - or perhaps floating - in front me: the Haydar Aliyev Center. Looking out at the city from the Haydar Aliyev Center, it is difficult not to miss the daily changes in the landscape of Baku, this Muslim nation's capital on the shores of the Caspian Sea. Rich in natural resources, Azerbaijan is not too shy to boast of its developments and growth in the construction sector, and the country has a taste for especially ostentatious plans. 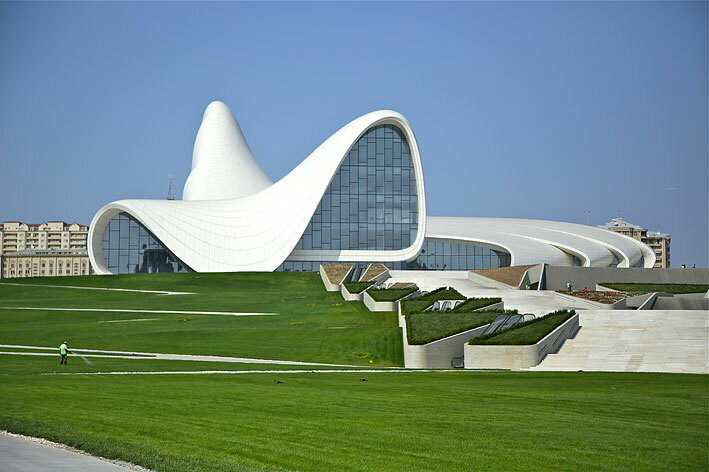 The architect of the Haydar Aliyev Center is Iraqi-British Zaha Hadid, known for her futuristic designs that have taken shape around the world. As this New York Times piece describes Hadid’s work, it “illuminates her capacity for bridging different worlds: between traditional perspective drawing and slick computer-generated imagery, between the era of utopian manifestos and the ambiguous values of the information age”. Indeed reminiscent of a Star Trek warship, the Haydar Aliyev Center is a massive cultural complex envisioned to host conferences, exhibitions and installations. It was built at an estimated cost of USD $250 million and opened just in time to mark the late president’s 89th birthday. During my visit to Baku, the Center was exhibiting Andy Warhol’s work. Since Sunday was my only free day, I thought I would stop by and finally visit the center. To my surprise, it was closed. Having lived abroad for many years, I have become accustomed to museums being open throughout the weekends given that this is the only time families have free time to visit museums. Unfortunately, this was not the case in Baku. And while the ads for exhibition were featured all across town, it wasn’t so much of a popular destination. Looking at the most recent available statistics, such turnout is not surprising. On average, 1,846 Azerbaijanis visited museums in 2011, according to the Statistics Committee of Azerbaijan. A local expat living in Baku said perhaps only a dozen visitors were at the museum when he visited the exhibition (which was shortly after it opened). Perhaps it received more interest at other times, but being closed on a Sunday means average working Azerbaijanis have little opportunity to visit the center. A pity, especially when one considers how expensive most of the exhibitions are abroad. At the Haydar Aliyev Center, the entrance fee was 5AZN (approximately 5 EUR). Disappointed with the center being closed, my next stop was the Carpet Museum (not to be confused with the new Carpet museum... more on this later). The old museum is located within the Soviet museum building, now the Museum Center of the Ministry of Culture and Tourism of Azerbaijan Republic, right across the Baku promenade. It is also home to the national Theatre Museum and the national Museum of Independence. The staff was kind enough to stay open a little later, given that it was quarter to six and the museum was set to close. The museum staff assigned a guide to explain the history, the designs and the origins of the carpets on display. The beauty of all these regional carpets was really mesmerizing, but what was the most striking was how they were exhibited: unprotected and covered in dust. Some of them were hundreds of years old and yet they just lay there on the floors or hung from the walls. Noticing my disappointment and as if reading my thoughts, my guide informed me that, unfortunately, most of the carpets were already packed away and ready for transportation to their new home: the new carpet museum. Unconvinced, I later came across a report released in 2004 by Timothy Mason and commissioned by the Council of Europe where the author indicates that the poor handling of historical artifacts and museums was due to “poor facilities, lack of temperature and humidity control, air-conditioning and special lighting” and other similar maintenance issues. This, however, is gradually changing with the new museums across the city. The Gobustan Rock Art Cultural Landscape located just an hour drive from the capital (64 km) is home to some outstanding prehistoric petroglyphs and the Zoroastrian fire temple (Azerbaijan was first known for its worship of fire before the country converted to Islam). The area was declared a national historical landmark in 1966 and a UNESCO World Heritage Site in 2007. The small two-story museum building was completely renovated in 2011 and was impressive to visit. For 2 AZN (the carpet museum cost 5 AZN) one finds onself in a time lapse. Beautifully done, modern, and informative, the museum was an interactive walk through the history of petroglyphs and their arrival to Azerbaijan. Leaving the museum and heading to the park itself, disappointment took over. The poor maintenance was once again visible. The drawings over the massive stones were fading. A pity, given the historical significance of the park. There was no protection covering the engravings except a sign that read “Do Not Touch”. 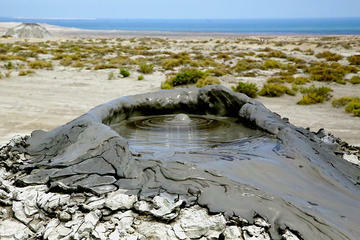 Not far from Gobustan Park, there are mud volcanoes. It is a difficult road to find, as there are no signs. Once there, however, it is an impressive sight. The mini volcanoes bubble and make sounds every time there is a mini eruption. There is also no entrance fee. It is a rough ride up but with a better-equipped car it is possible to reach the destination. Back in Baku, the newly-built but yet-to-open new carpet museum (originally scheduled for opening by the end of 2012) was the next destination. 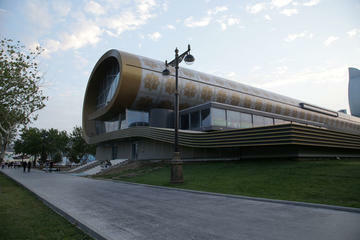 The mass structure on the Baku promenade clearly stands out, as it is designed in a shape of an unfolding carpet. If it wasn’t for the golden color design on top, it would be hard to guess that, in fact, it is indeed in the shape of a carpet and will soon be home to a new carpet museum. Perhaps it will take better care of the country’s rich collection of colorful, hand-made carpets representing different schools of carpet weaving as well as regions. According to the most recent data from the State Statistics Committee of Azerbaijan (2011), in total there are 227 museums in Azerbaijan. The museums' subjects range from history, art, literature, science and technology to natural history. The Ministry of Culture controls the largest number of the museums in Azerbaijan, while the rest are distributed among other ministries and state departments. The website of the Ministry of Culture and Tourism provides information on every museum in the country. The country's changing landscape, attitudes, and interests will perhaps also change the current state of museums in Azerbaijan. While grand projects as the Haydar Aliyev Center offer impressive sights built with impressive budgets, not every museum receives such an attention. There is a lot more work to be done in maintaining the old while building the new. Walking through the narrow streets of Baku’s Old City - another UNESCO-protected site - one cannot stop wondering if one day all this beautiful history will be gone, replaced with expensive modern replicas, futuristic designs and more concrete.